After years of experimentation and expanding from a small group of designers, Green Guru offers a lengthy catalog of high-performance gear and products that disregard social, quality and sustainability standards by pioneering an exceedingly revolutionary line of products that follow a path where the grass is always greener…and still there. In reclaiming and recycling everything from bike tubes, banners, wetsuits, climbing rope, and PETE recycled plastic bottles Green Guru actively reduces landfill waste and re-engineers useful products, from backpacks, bike Gear, and Messenger bags to Duffles and an assortment of accessories like reflective pins and even beverage coozies. Besides creating local jobs, Green Guru also produces all of its products in Boulder, Colorado. Additionally, Green Guru provides for an additional Recycling program that takes in those hard-to-recycle materials so they don't end up in a landfill or out in that Texas-sized plastic patch in the Pacific Ocean. More so, with quality products like the Green Guru Duffster Duffle Bag produced in the exchange — that old bicycle inner tube you dropped off at one of the nationwide Green Guru recycling drops can now haul your gear to your favorite adventure locales. Whether you are out for a gear-heavy day out on the trail or out for a fun filled afternoon on the beach — the Green Guru Duffster Duffle Bag gives you the 66 L capacity to pack in all the essentials and carry them right on back out of those unsullied hidden gems out and about the elements. And with any bit of Green Guru Backpacks and Luggage aiding you on your way, you can rest assured that wherever you end up - the grass will always be greener because of it. 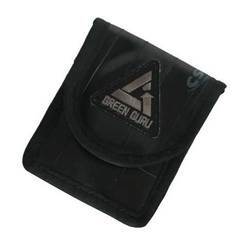 More still, Green Guru gives you an added layer of protection for you and your essentials by offering a considerable amount of products that are waterproofed to stand up again rain, sleet, snow, or wind so you can concentrate on enjoying whatever mother nature might unfold in front of you. With the Green Guru Bike Tube Cell/MP3 Holder, for instance, if you get caught out on a run in the Southwest and a monsoon storm decides to unload on you, well, at least you have a soundtrack to enjoy it to. And with the Velcro closing keeping those invasive gusts of sideways rain at bay while Upcycled Bicycle Inner Tube, Liner Fabric and Nylon Webbing at the core of the Green Guru Cell/MP3 Holder's material construction - There is not much holding you back from embracing a walk in the rain.